Special Edition of Subtract On The Pier. 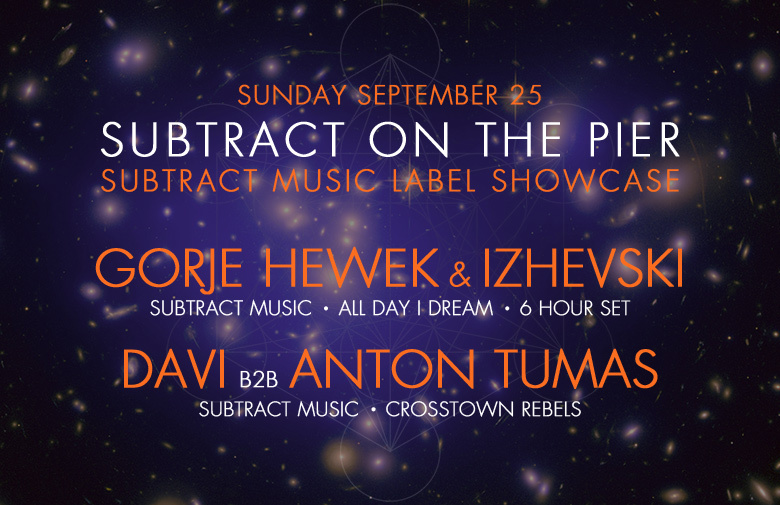 An incredibly talented line-up of our artists for a Subtract Music label showcase! Gorje Hewek & Izhevski make their long-awaited return with a rare treat, a 6 hour extended set. With emotive releases on All Day I Dream, Shanti Moscow Radio and Subtract, the boys hardly need an introduction! Playing b2b with Anton Tumas is the LA techno stalwart DAVI, whose set at Woogie Weekend Subtract Afterhours left many speechless.